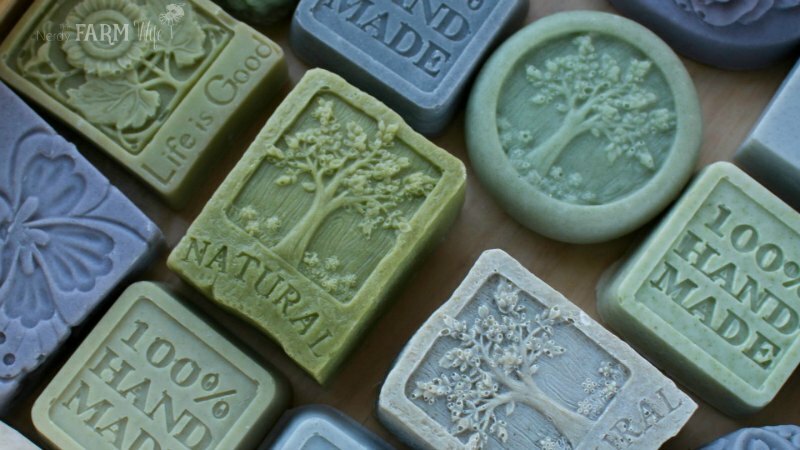 BECOME MORE CONFIDENT & ADVENTUROUS IN YOUR SOAPMAKING! This online course dives deeper into six areas of cold process soapmaking that can seem extra challenging or intimidating to soapmakers. Each lesson will equip you with the information you need to experience further success in your soapmaking endeavors, and provide inspiring recipe videos to demonstrate that lesson's theme. This program is ideal for both beginners and more experienced soapmakers alike! Despite my ten year experience with soap making, I still find new and interesting techniques and instructions whenever reading about soap making and your course is no exception. Your teaching techniques are universal - for novices and experienced soap makers alike. Incorporating written, visual, and the actual recipes is so well done and extremely helpful for any kind of learner. Thank you for taking the time to produce this course. I look forward to enjoying your future courses. My kids and I are LOVING the soap making course. It's really awesome and makes me so much less afraid of soap! • This section includes a downloadable guide and video tutorial for those who are brand new to the hobby. If you're a more experienced soapmaker, feel free to head straight to Lesson 1. 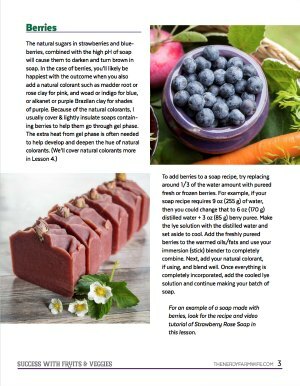 • Learn the best ways to incorporate fruits and vegetables into your soap recipes. We'll cover some popular additives such as pumpkin, carrot and cucumber, along with other unique options including citrus fruits and berries. • Infuse your soaps with the natural goodness of flowers and herbs. 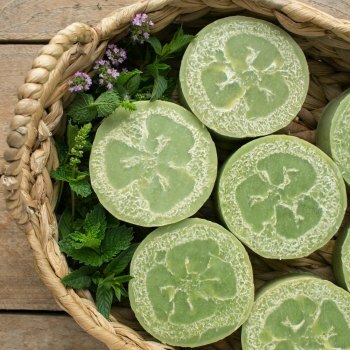 Find out which herbs work well in soap, and which ones are better saved for other projects. 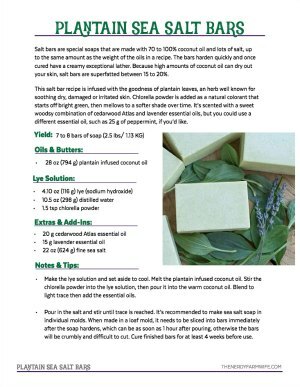 • Explore the many alternative liquids that can be used when making soap. Both vegetable-based and animal milks will be covered, along with other interesting options including, but not limited to, kombucha, wine and apple cider. • This week is filled with information on natural colorants and demonstrates that natural most definitely doesn't mean boring! You'll learn how to use botanicals and clays to soap all of the colors of the rainbow! • Discover some simple design techniques that add visual interest to your soap, without being overly complicated or intimidating. • This lesson will teach you how to make attractive soap labels for your new creations using downloadable templates and an easy online program. 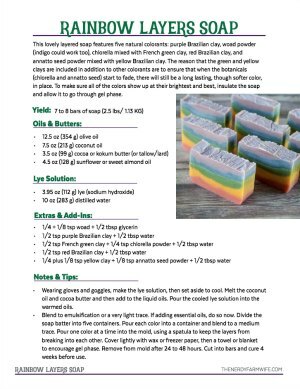 • This section contains printable charts and other useful resources that will be helpful for you along your soapmaking journey. These videos and guides will help you go beyond making basic soap recipes and will level up your soapmaking skills. Get the soapmaking success course plus my popular natural soapmaking ebook collection filled with 60+ palm free recipes and save $5.00. Do your recipes contain palm oil? Lard or tallow? Coconut oil? All of the recipes in the Soapmaking Success Course and Natural Soapmaking Ebook Collection are palm oil free. A few recipes suggest tallow or lard, but a vegan substitute option is always given. The majority of the recipes do call for coconut oil, but in some cases, substitute options are given. (Babassu oil makes a great stand-in for coconut!) You can also ask in the private Facebook group, the comments section of the course, or email me at hello@thenerdyfarmwife.com if you have a question specific to the course or ebook collection. When will I get access to my course? Check your inbox for a set of emails from Teachable. Read through each one carefully. If you don't get these emails (and they're not in your spam, trash or junk folder) within an hour or two - please contact me right away at hello @ thenerdyfarmwife.com so I can help out. *Make sure to confirm your email account and set up a password BEFORE accessing the course, otherwise you'll see the sales page instead of the course information. * You have lifetime access to your purchase, so don't hesitate to let me know if you ever need help finding it again! If you also purchased the ebook collection, you'll be able to download the zip file (containing the ebooks and related files) immediately after purchase. I'll also send you a follow-up email saying thanks for your order that will have a link to the files as well. How can I read the PDF ebook files on my Kindle? You will need to email the PDF file to your Kindle device. Each Kindle has a unique email address associated with it. To know what yours is, go to Amazon.com --> Your Account --> Digital Content --> Manage Your Content & Devices. Next, click the "Your Devices" tab and you'll see all of the devices associated with your account. Each one will have a unique email. Send an email to your @kindle.com address with the PDF file as an attachment. It should soon after be available in your Kindle library. How can I read PDF ebook files on my iPad? PDF files can be opened with the free apps iBooks or Adobe Reader. My download link won't open correctly. What should I do? Every so often a little hiccup in the system happens, especially with mobile devices. When all else fails, it usually works for me to send the ebook files as email attachments. If you're having trouble with your download and would like to try this method, just shoot me an email to hello @ thenerdyfarmwife.com and I'm happy to help! Thank you for understanding that it sometimes takes a few hours for me to see and answer emails about orders. Prices are in U.S. dollars. If you're in Canada or another country, the final total will adjust at the end of the checkout process, according to current currency rates. Please note these are digital products that you download or view on your computer, tablet or other digital device. No physical items will be shipped to you.